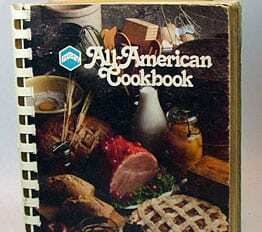 MOBAY All-American Cookbook, by Mobay Chemical Corporation, Agricultural Chemicals Division, Printed by Kansas City Press, Inc., copyright 1981. 214 pages, spiral bound cookbook with individual recipes submitted by individual organizations or people, just like every other club or church fund-raising cookbook you’ve ever seen. The difference is, the contributors are relatively large and important companies: Chicken Liver Pate by the Diamond Walnut Growers, Cucumber-Yogurt Dip by the American Dairy Association of Wisconsin, Pork Chops in Orange Sauce by the State of Florida Department of Citrus, you get the idea. 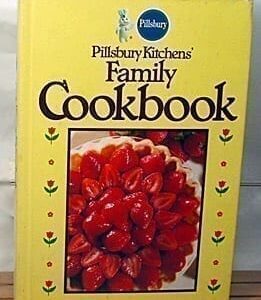 The list of organizations that submitted recipes to this cookbook includes: American Dairy Association, many California fruit advisory boards and associations, Diamond Walnut Growers, Floriday Fruit & Vegetable Associations, Michigan fruit and vegetable associations, Montana Grain Growers Association, National Broiler Council, National Live Stock and Meat Board, and more, all experts in their specific fields regarding food. The recipes all sound terrific! Excellent vintage condition. All pages clean and clear.